Sam Milby on the seemingly never-ending question about Marie Digby: "Ngayon, there is no expectation at all, just enjoying the friendship." 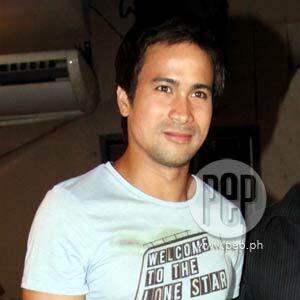 Six years (and counting) in show business is not bad for Filipino-American actor Sam Milby, who initially received feedback that his baluktot na Tagalog will take him nowhere. Fifteen television projects and nine movies are no mean feat. Add to these his recent Gawad Urian nomination, which he wasn't expecting. When he did the role of Wesley in Third World Happy, he knew he was in for "a lot of pressure doing the extreme." The indie film's director EJ Salcedo had the 27-year-old star in mind when he wrote the story, and eventually approached Mr. Johnny Manahan, the big boss of Star Magic, to pitch the project. At the presscon held last week at the Polari Comedy Club on Tomas Morato Avenue, Quezon City, EJ said he prepared a PowerPoint presentation, and showed him some aspects of the film-to name one, "mahahaba yung conversations." The new director related, "I don't cut if it's long. If it's boring, then so be it." Another thing: He wanted to show a different Sam—who will not wear makeup, will grow a goatie, and will not conceal his eye bags. Moving on, "The challenge for me was most of Sam's movies are...is more of being happy and more of romantic comedies. So I wanted to challenge myself, not only [for] Sam to do something very different. I was really afraid that Sam and the fans' club would get mad at me." SAM, THE ACTOR. Sam's portrayal of Wesley was noticed by film critics. "Malalim" was said to be the most fitting way of describing his performance. It helped that in real life, he's into a similar situation-Sam left his home and family in the States to pursue his dreams here. And he was also glad that direk EJ is "very open" in a way that, "I'm giving inputs on how to attack," Sam shared. What can he say about the nomination he earned from the Gawad Urian? Smiling, he answered, "I really didn't think [of it]. I should not 'cause I wasn't expecting. Yung mga kasama ko sa nominations—si Coco Martin, si Pen Medina, these are all actors who always win the awards, who were always nominated. 'Eto ang unang nomination for best actor. Noong 2006, I won best movie actor, pero 'eto naman ang first nomination for best actor award." Doesn't he feel threatened by the influx of young and good actors? "If you're going to be around, for, you know, however long they want to be. And when you think of their name, alam mo na, na magaling ang performance nila. It's like when you hear Sean Penn. When you hear Sean Penn, alam mo na maganda ang performance niya, it's the same with them. You already know that we expect that the performance would be great." And he's glad that he's now able to be more selective about his projects. "Pero ngayon, of course, I wanna have a direction I wanna...I wanna [have] branding, I guess. I give a lot more of my feedback kung ano ang gusto ko, but at the same time, it's only up to management, to [and] the executives of ABS-CBN to give me the roles that [I] can live it myself or that really [I] believe that I belong." He grew up watching and liking the movies of Edward Norton and Sean Penn, and recently, Leonardo DiCaprio ("because of Inception"), and his ultimate goal is to be like them. "Nagbabaka-sakali ako na, I just wanted this at the roof and nagbabakasakali lang. A, kelan mangyayari 'yon sa future?" he quipped. NOT YET READY FOR GAY ROLES. When asked about the characters he wanted to do, he just said, "out of the box." Yes, he's open to doing a "baliw" role and will not shun a great acting piece, but winning an award will be not be his primary motivation. "It's all about enjoying what you do and improving your craft," he said. He feels iffy but he's not totally saying no to gay roles a la Ennis del Mar and Jack Twist in Brokeback Mountain, but, "It really depends on the script." And just in case he'll ever be ready to kiss another man on screen, Sam will choose one of his closes friends in showbiz, "John Prats." Again, he underlined, "It's ah, uhm, depende talaga sa script."